If you suffer from post thrombotic syndrome, a symptom of Deep Vein Thrombosis (DVT), you know how frustrating it can be. It all started with a blood clot hidden deep inside your leg. You had no idea you had something that could be a silent killer inside of you until you suffered the symptoms. It began with a deep ache that never goes away. You knew something wasn’t right when your leg started to swell. The cramping and the tingling have been nearly unbearable. Then the leg ulcers appeared. The moment these nasty sores developed on your leg, you knew you were in trouble. You’re tired of dealing with your discomfort. Your top priority needs to be finding a solution to effectively treat DVT post thrombotic syndrome before it progresses. There are various steps that you can take to deal with post thrombotic syndrome. The sooner that you treat the condition, the better. Compression stockings are one of the most common remedies for blood clots in the legs. While they will not completely resolve the problem, they do keep the condition from getting worse as they promote healthy circulation in your legs. They come in varying levels of tightness. Make sure you ask our doctor which is right for you. Medications can also be helpful, thinning the blood and dissolving blood clots. In addition to these treatments, you may be able to take advantage of one of the latest innovations in the field. It involves a surgical procedure that is minimally-invasive. A catheter is inserted into the vein that is affected by a clot. At that point, a type of medication is infused through holes in the catheter to dissolve the clot, nipping the problem at its source. Why Consider Early Intervention for Your Condition? 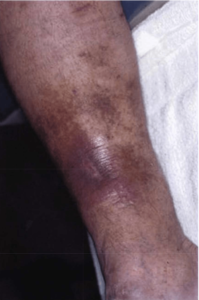 If allowed to progress, post thrombotic syndrome could result in disfigurement from leg ulcers that will not go away. You could be at greater risk for a life-threatening pulmonary embolism. Worst of all, you will have to deal with debilitating pain that will force you to put your feet up. Being less active will only make your problem worse. You’ll be caught in a vicious cycle if you don’t do something about it. You know your body. You know if something isn’t right, especially when the symptoms are obvious. Visit Miami Vein Center as soon as possible if you have symptoms of post thrombotic syndrome. Our doctor can look at your legs, discuss your concerns and review your medical records. If it is determined that you do have post thrombotic syndrome, it is important to act immediately before too much damage is done. The sooner our board certified doctor begins treatment at our office in Miami, the sooner you can find relief. Contact us today to schedule a consultation.